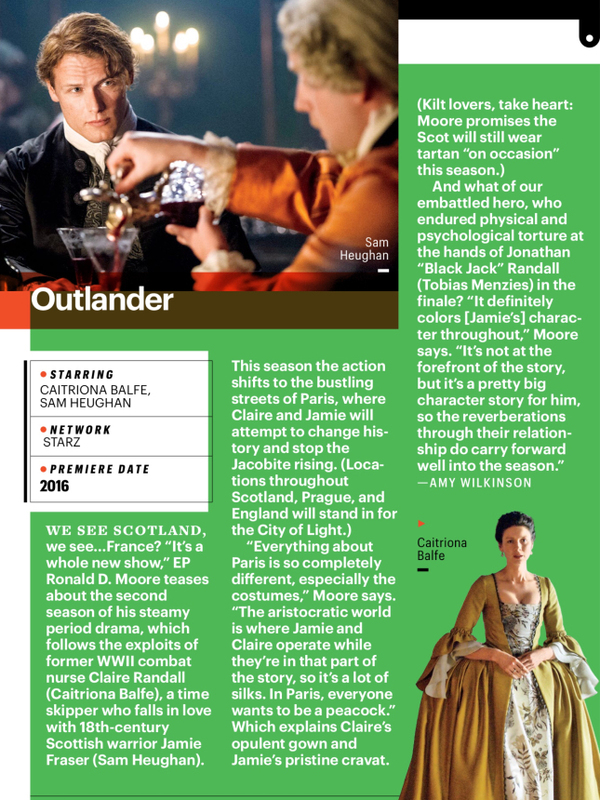 Thanks to SamCait Life we have an early preview of what will be in next week’s issue of Entertainment Weekly, our first look at Season Two of Outlander. . . and it looks amazing! This is from the SDCC issue with Batman, Superman, and Wonder Woman on the cover. 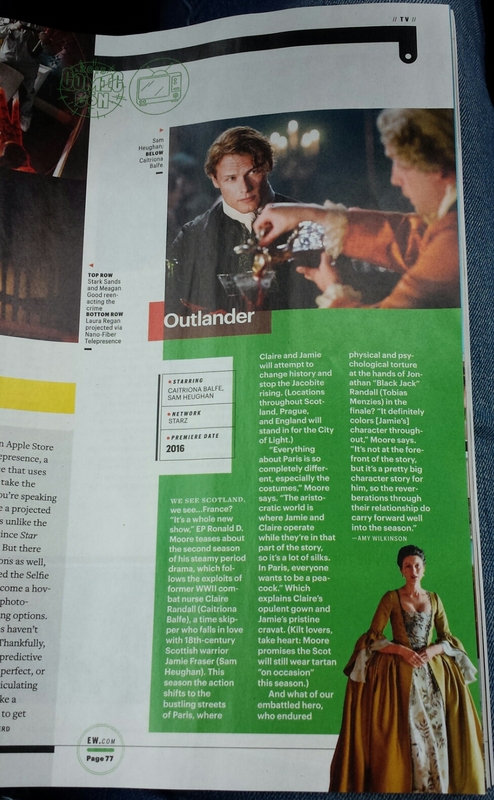 Two photos are included, one of Sam Heughan as Jamie and one of Caitriona Balfe as Claire. 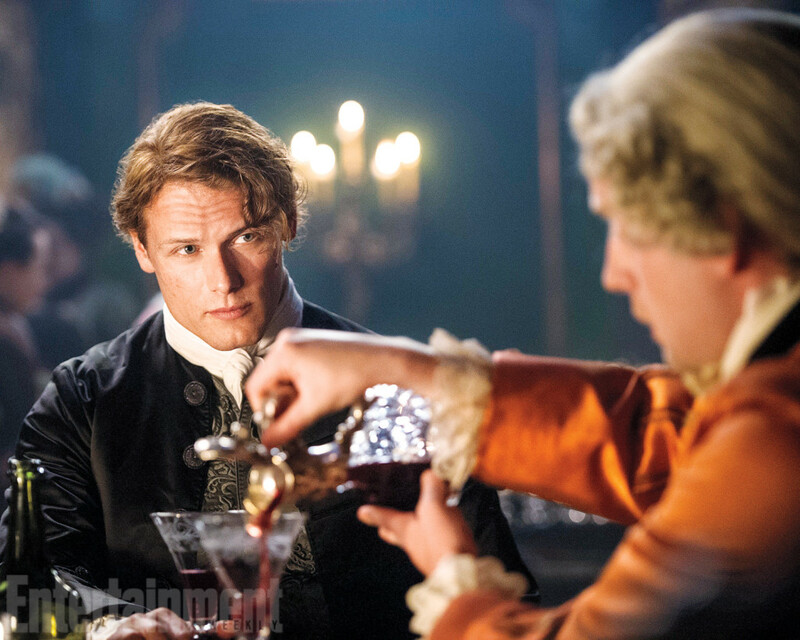 The premiere date is only given as “2016.” The hair, the costumes, the quotes from Ronald D. Moore are all the Outlander fans need to tide them over for a while. Thanks, Ron and Starz! Releasing the first photos this early makes me think we will see some Season Two scenes at SDCC. Update (7/3/2015): EW released a full interview with Ron that was used in the EW article. 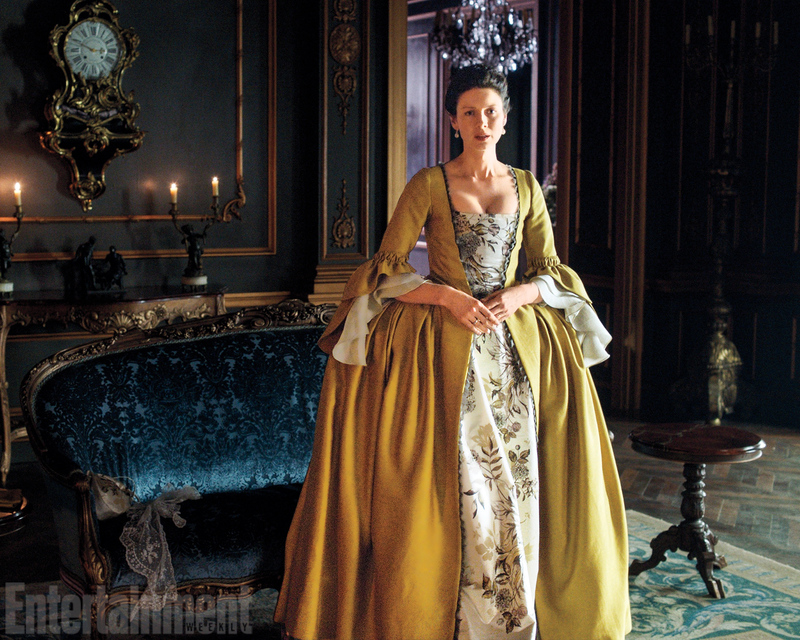 Also, HQ photos of those used in the magazine, especially Claire without the green background. 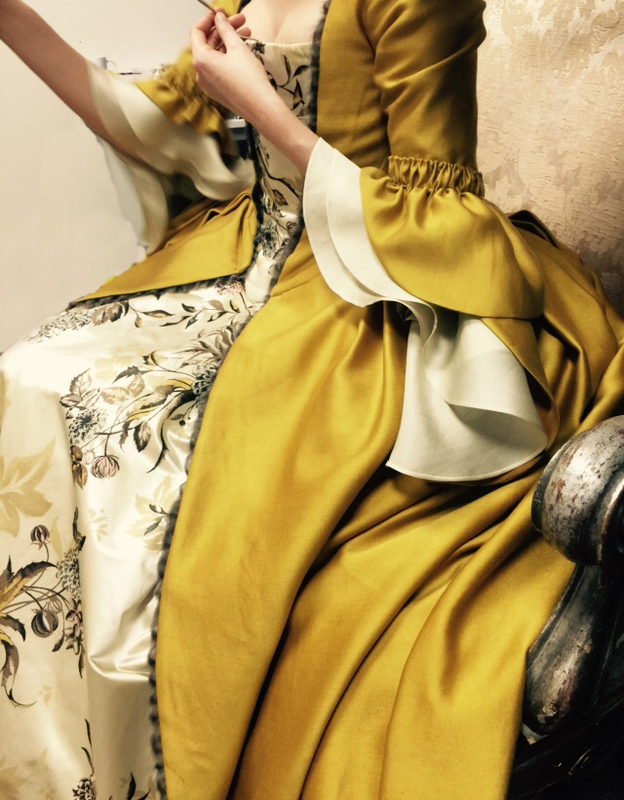 Terri Dresbach (costume designer) released her own photo of the dress and details about it. Update #2 (7/3/2015): Added a photo of the feature in the magazine. Excerpts from Ronald D. Moore’s interview, read the full interview at EW. ENTERTAINMENT WEEKLY: I understand you’ll be doing a bit of globe-trotting as the season progresses, Ron. What part of the Outlander world tour are you in right now? RONALD D. MOORE: We’re at the end of the beginning, as Churchill would say. We’re in the second block at this point. We shoot them in blocks of two. I think we’re on episodes 4 and 5 at this point. What locales are on your itinerary? Several cities are standing in for Paris, correct? And that kind of goes across the board for all the departments, frankly. The art department faces a similar challenge. There were really no sets or pieces of sets that we could use for Paris that we’d used for Scotland. We had to build an entire apartment for Jamie and Claire to live in. There are carriages, there are servants with livery, there are props and furniture. It’s completely different. It’s a whole new show. It will look completely different than season 1. 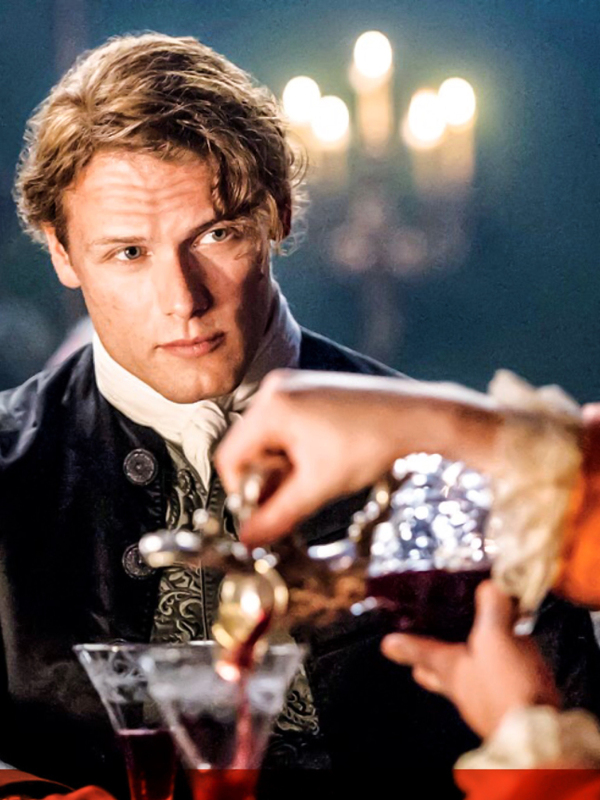 For fans who’ve read the series’ second book, Dragonfly in Amber, how closely would you say this season hews? I think there’s more adaptation. I think there are changes. For fans who know the book, they know the book is a more complicated structure in terms of how Diana wrote it. The point of view changed a couple of times in the book. She played with more stuff with time going on in the second book. The interior storyline of the politics of the Jacobite rebellion and Paris is more complex. So it was not as easy an adaptation as the first season was. The first season was more of straightforward, “Okay, we have to sort of make changes that clean up this narrative line, that make it a through line for television and carve it into episodes.” But it was always kind of clear what the basic structure was: Claire’s trying to get home, then she meets this guy, now she’s falling in love, now she has a conflict, will she go home. You lay it out in a very linear fashion. Book 2 is just a more complex book. It’s laid out very differently, as a result it took more wrangling to try to figure out how to translate this particular story into our season. There were more complications, there were more characters, there were more shifting points of view. It was a bigger task. The thing that gives me the most comfort is that Diana likes it a lot. She had said, “Oh, I really liked the way you did it. it was a difficult plot, I know, but I think you really found the essence of it. You really found the through line that really defines what this part of the journey is.” So I feel good about it. It’s not going to be a literal adaptation because I don’t think that’s possible with the second book…. But I think it’s very much the same story, the major characters are all represented, the major scenes are all represented, and it still gets you to all the same places you want to go. 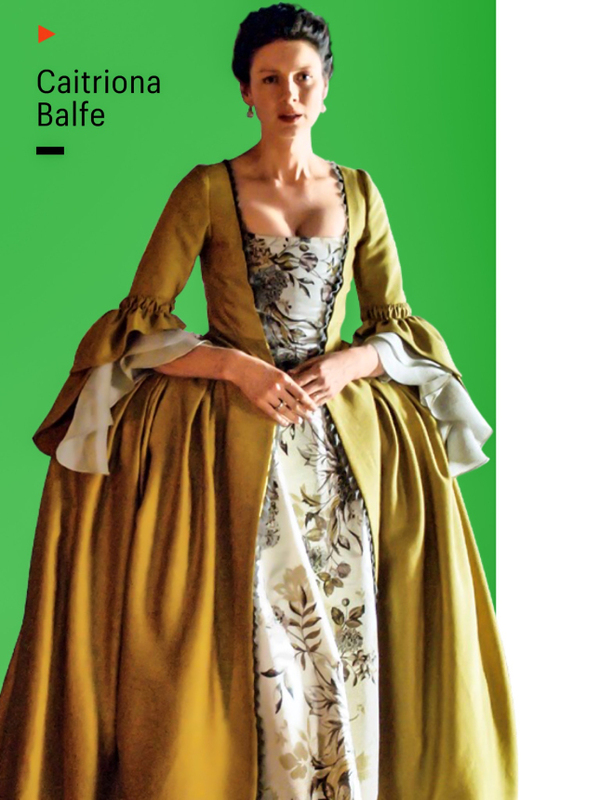 This entry was posted in Caitriona Balfe, Interviews, Production News, Production Photos, Ronald D. Moore, Sam Heughan, Terry Dresbach, TV Show News and tagged Caitriona Balfe, Dragonfly in Amber, Interviews, Official Photos, Ronald D. Moore, Sam Heughan, Season Two, Terry Dresbach by Sarah Ksiazek. Bookmark the permalink.